Daniel and Ursula of Blackenbrook Vineyards have a total focus on quality in everything they do; that’s from the vineyard to the bottle. Absolutely everything that goes into putting a bottle of wine on the shelf is managed minutely by them at their delightful hillside site above the Tasman village. Careful wine making, using processes that are gentle on the fruit that has been lovingly and superbly nurtured in their vineyards for each variety. We expect Sauvignon Blanc to be fresh and lively with lovely tropical fruit and capsicum-like flavours, the Blackenbrook examples of this variety deliver these characters but with juicy acidity and a brightness often missing from some versions. Pinot Gris is another variety that can be a bit disappointing when it is over-cropped and treated as a cash crop, but at Blackenbrook Vineyards, Daniel and Ursula treat the variety with respect, resulting in a wine that may be easy to drink but has that purity of flavour we have come to expect, it is a refined wine with elegance while still retaining wonderful fruit characters. 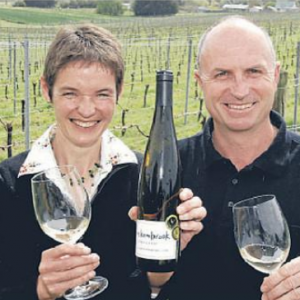 Another thing to love about Blackenbrook Vineyards is the price point, they deliver incredible value for money and that is why they are some of the most popular wines on the shelves at Fresh Choice Nelson. Locals supporting locals is a wonderful thing, so next time you want a wine that is truly expressive of the variety you want, look for a Blackenbrook Vineyards wine. Meal Bags… Paula’s at Fresh Choice Nelson to inspire you! I hope many of you have had a go at cooking some of the Inspire Meal Bags available at Fresh Choice, Nelson over summer. I have been busy creating a whole new bunch of recipes for the meal bags, so you will be seeing some new ones in store soon. For those of you who are not familiar with the concept, I have been working with Fresh Choice to create some great tasting dinner recipes. The ingredients and an easy to follow recipe card come conveniently in a handy bag ready for you to cook for dinner. Each bag serves 4. The bags are good value and a great way to get other members of the family to cook… like the kids! You can buy them in store or order online to pick up at Fresh Choice Nelson. They are great idea if you have friends coming over or if you are stuck for a dinner idea and also make a healthy replacement for weekly takeaways, most can be prepared and cooked in under 45 minutes. If you have tried them, you may have seen that I use coconut sugar as an alternative for white refined sugar in the recipes. While it is best to limit sugar in general it is sometimes needed to balance a dish and coconut sugar is always my preference. finish off a meal. I created this recipe for a more natural, refined sugar free ginger slice. Pop it in the freezer and enjoy a piece after you have create your Inspire meal bag. Melt chocolate and coconut oil and stir in all other ingredients. Press intoa baking tray lined with baking paper. Place in the freezer to set. Place all ingredients in a blender until smooth. Pour over base and sprinkle with Pistachios or shredded coconut. Place in the freezer until set. Cut into small slices and keep it stored in the freezer.